A reader coming upon this book unawares might not be immediately inclined to use that adjective. 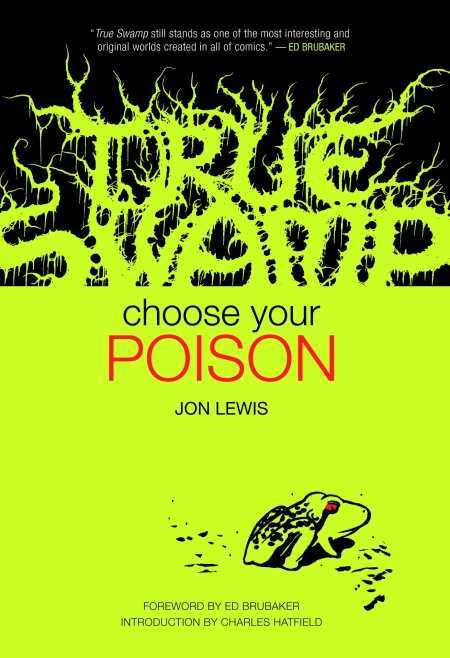 At first glance, Jon Lewis’s art seems too raw to serve its purpose, with final pages that can closely resemble extremely rough, even unfinished, layouts. But behind and beneath that loose, cartoony facade lurks a masterful grasp of both the conception and execution of the visual narrative, attributes that make True Swamp a comic of the highest order. Ostensibly a “funny animal” book, a genre that embraces everything from the Garfield comic strip to more mature-minded material like underground comix pioneer Robert Crumb’s Fritz the Cat, True Swamp was originally released in the late 1990s. Despite garnering some favorable attention from critics and fans alike, the series seemed to ebb and flow, sometimes appearing regularly before abruptly disappearing from comics shop racks, until it found a more permanent home online a few years ago. Despite those untimely interruptions, Lewis has continued to delve into the thoughts and behaviours of his varied cast of frogs, salamanders, birds, ants, faeries, and the occasional human with entertaining, even enlightening, results. And while it’s true that there is a fair amount of anthropomorphic projection underlying the proceedings—after all, one of the primary purposes of art is serving as a means to observe ourselves, collectively and otherwise—True Swamp remains a unique place. It’s a world more concerned with exploring the practical effects of a philosophy based upon the tenet of eating only living things, or the emotional fallout of interspecies dating, than other, more pedestrian subjects. Yet, those same characters and their concerns, no matter how idiosyncratic they may initially seem, come to matter a great deal to the reader. Which is perhaps the greatest compliment one can pay any work of fiction, and the key to the enduring allure of Lewis’s animal kingdom: No matter how strange their origin, behavior, or appearance, these are characters who fully, wholly engage us, heart and soul.